Craps was a game that I had only come across in the movies! 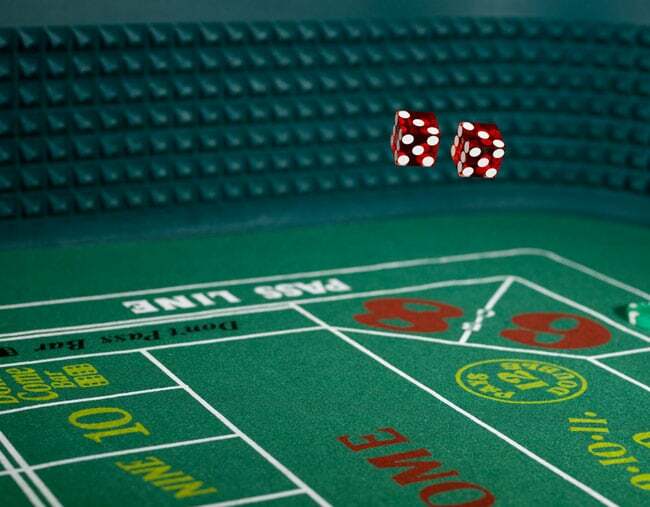 However it turns out that Craps is an extremely popular game in land-based casinos but when it comes to online casinos a lot of online gamers don’t indulge. But that’s not to say that it doesn’t have its advantages for online players – both experienced and novices. For beginners it’s a great opportunity to learn the game in a less frenzied, more controlled environment while for the experienced the online version of the game offers an uncrowded, more relaxed experience of the game. There are a lot of bets in craps and a live game can be intimidating for the beginner and even overwhelming for the more experienced. Craps appears very difficult but it is actually quite a simple game which could be said to move in different stages. Stage 1 is the first roll of the dice – the ‘come-out roll’ where the dice are thrown by the shooter towards the table wall opposite his position. This could be the end of the game if the shooter throws a 2, 3, 7, 11 or 12. However if he throws a 4, 5, 6, 8, 9, 10, the number thrown becomes the ‘point’ and the dealer will then place a ‘puck’ (a marker) on that number on the table. Once the point has been determined, the game moves onto stage 2, with the same shooter throwing the dice again until either the point number has been rolled again or a seven is rolled. When one of these two things happen the round is over and the game starts all over again. It is at this point that players make different bets – for example they might bet that the shooter will roll the same point number – the ‘Do’ side. The others, the ‘Don’t’ side might bet that the shooter will roll a 7 before the point number is rolled. Others might bet on things unrelated to the point – such as ‘place’ bets and ‘proposition’ bets. Online craps is very similar to the land based version, but there is a lot of lingo, a multitude of betting options and an awful lot of action. It can be extremely overwhelming for the new player, but this is where online craps really comes into its own. You can play at your own pace without getting confused by the countless bets made by the other players. Some quick tips for beginners are to stick to the Right or Do side of the table and play the pass line – it’s an easy option which you should stick to until you know what is going on. You should also play at the minimum until you really understand the game properly. Another tip is to take proper odds as this reduces the house’s edge. Also place the 6 and 8 if you are looking to do more than just betting on the pass-line and odds-combination, as these numbers offer the best odds out of any of the place numbers. Avoid proposition bets as the houses edge on these is poor – stick with the bets that have the lowest edge. Finally manage your money, set yourself limits and learn the game – this way you have the best chances of being a winner! You can try Craps at the following Online Casinos: Paddy Power Casino, Spin Palace Casino and William Hill Casino.